BJ Cole can without a doubt be called a living legend. He has been an active musician since the early 1970s within a wide range of genres from pop and rock to jazz and more experimental music. His list of credits is substantial and impressive, to say the least. He has played on albums and toured with Sting, T. Rex, Bjørk, Emmylou Harris, Elton John, Iggy Pop, REM, Brian Eno, Luke Vibert, David Sylvian, Roy Harper and countless others. The group 1982 had discussed often, over a long period of time, that it would be exciting to invite a guest to play with them. This would help them develop as a band and explore new terrain. Nils Økland suggested BJ Cole. They had played together by chance a few years earlier on the initiative of BBC 3 Late Junction presenter Fiona Talkington. BJ Cole brings a new sound dimension to the music of 1982, and the soundscape plays perhaps a greater role on this album than on previous ones. But above all, this is intriguing music with a solid basis at the point of intersection of many different genres. Fiddler Nils Økland comes from the world of folk music, and is internationally recognised for his innovative style of playing. He has released solo albums on the ECM and Rune Grammofon labels to rave reviews, and was a member of the Christian Wallumrød Ensemble for many years. Sigbjørn Apeland plays church organ and harmonium, and holds Norway’s only doctorate in ethnomusicology. He is renowned for operating in the borderland between folk music, church music and improvisation, and has played with musicians such as Håkon Kornstad, John Stevens, folk singers Åsne Valland Nordli, Berit Opheim Versto and Agnes Buen Garnås, electronica innovators Alog, and noise duo Golden Serenades. Drummer Øyvind Skarbø studied with Terje Isungset and has made study trips to Nigeria and Cuba. He currently plays with Bly de Blyant, BMX and Håkon Kornstad. The album was recorded and mixed at the Grieg Hall together with technician Davide Bertolini. The atmosphere can suggest, at different times, medieval, liturgical music, finger in the ear folk, and the Velvet Underground, which is a pretty good combination. Mostly warm and lyrical moodscapes full of plangent burbling, dreamy drones and post-rock glitches, lightly doused in Cole´s golden glissandos of molten guitar. Chamber-music lullabies from another galaxy. Here we have free improvisation pared down to a nocturnal, twilt rumble…It´s a refined blend of jazz-folk with resemblances to the yearning plateaus of Japan in their Rain Tree Crow phase, making for a perfect autumnal soundtrack. Americana takes on some slender, magical eerie textures in the hands of pedal steel guitarist BJ Cole and Norwegian Hardanger fiddler Nils Økland who cross elements of country rock, Norwegian folk with ecclesiastical. Although the combination of fiddle, harmonium and pedal steel may suggest folk music more than improvisation, the end result is a happy amalgam of the two; the resulting music has a gently evolving sense of melody that radiates tranquillity. All four players contribute to its subtle beauty, with Cole not rocking the boat but fitting into the ensemble as if he has always been there. His pedal steel’s mellifluous sound joins in seamlessly alongside the fiddle and harmonium, with the lead role rotating between the three; meanwhile, Skarbø contributes just enough percussion to give the music a pulse but not an intrusive beat. At under 34 minutes, the album is one of those that cries out to be played again as soon as it is over. It also leads to hopes that the collaboration between 1982 and Cole will be more than a one-off. More, please! Again, 1982 has put together a brilliant set of soundscapes that are magnificent to hear but also intriguing once you dig deeper into it on repeated spins. This collaboration with BJ Cole only highlights the skill of this trio once more. Another strong reason why 1982 is one of those unheard groups that needs to be heard. A real must have album. And a highly recommended one from me. And one of my albums of the year! The eight pieces here – each named solely according to their duration – were recorded live from an afternoon´´ improvisation at which some members met Cole for the first time. He´s less the challenging interloper than a natural fourth member… A collaboration filled with low-key charm. While in some respects this music seems fragmentary, the whole is richly satisfying…With “02:59″, the album’s eighth and final piece, 1982 and BJ Cole come about as close as they are ever likely to get to a regular folk rock form. Thankfully, for all its refinement it still sounds untramelled, wild and elemental. This is something of an unusual collaboration. BJ Cole, the legendary guitar player who’s recorded with the likes of Brian Eno, David Sylvian and, erm, Sting, has paired up with the Norwegian “folk” trio 1982…What stands out is how natural a collaboration this is. Cole’s pedal steel is understated and never tries to break free of the more sedate and laid back accompaniment. The arrangements are quite sparse, but they’re never quiet. The four instruments are each given their own time and space to explore their ideas, but it’s the jazz-influenced drumming of Øyvind Skarbø that sketches a framework in which the rest can arrange themselves. It’s a mesmerising album, and one that slowly hypnotises the listener and reveals its beauty over repeated plays. This self titled collaboration between respected steel guitar master BJ Cole & Bergen based trio 1982, mangers to mix & meld various genre traits together in a mostly fairly laid back & woozy sound soup… On the whole this is a most rewarding collaboration which will appeal to those who enjoy more structure & melody based improv, and those who enjoy looser musical genre mixing. After hearing BJ Cole´s pedal steel guitar playing on Depeche Mode´s Ultra, it´s easy to imagine Cole living in Louisiana, toting tales of once sharing late-night drinks with Robert Johnson. The truth is that Cole is one of England´s most prolific session musicians. Fans of ECM Records, meanwhile, might be aware of the band 1982. 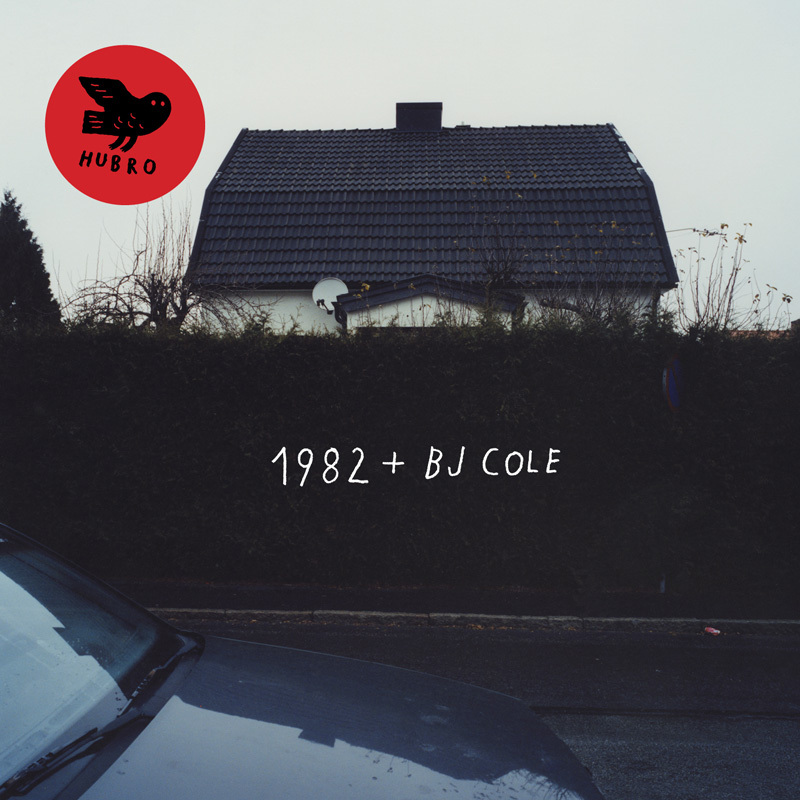 By bringing in BJ Cole, they´ve made an impressive album that sounds like something Jim Jarmusch could use as a soundtrack. After recording two studio albums as a trio plus the innovative “Bottlemail” project (see the band’s website http://www.1982trio.com for the fascinating details) the members of 1982 felt that it would be exciting to ask a guest to play with them… He is just perfect for 1982’s music adding yet another tonal element to their already heavily layered sound. To my ears Cole’s presence makes this release a more varied and satisfying record than the earlier “Pintura”, impressive though that was. The extra instrumental voice increases the aural possibilities and is an additional focus for the listener. Norwegian trio 1982 (Nils Økland, Hardanger fiddle; Sigbjørn Apeland, harmonium; Øyvind Skarbø, drums) is back with a second CD for the Hubro label, this time in a collaboration with legendary pedal steel player BJ Cole. This record is the result of a single day of studio work, which was the first time Cole and the trio met. Improvisations drawing from ECM jazz and European free improvisation. Fine textures, sweet melodicism, unusual yet obvious affinities between harmonium and pedal steel, intimate upclose recording. The disc is short at 33 minutes but very satisfying. Die Diskografie von BJ COLE liest sich wie eine Kater Murr-Version der Rockgeschich­te. Mit seinem Pedal Steel-Sound zieht er seit 1970 seine Spur von Humble Pie und Cochise in den 70ern zu Everything But The Girl und Microdisney in den 80er und über Peter Blegvad, Harold Budd, John Cale, Jah Wobble und Gorky’s Zygotic Mynci hin zu Basement Jaxx und Luke Vibert. Zwischem breitestem Mainstream und Abgedrehtem war er für Vieles zu haben. Hier bei 1982 + BJ Cole (HUBROCD2522) kommt er nun ganz groß zur Entfaltung. Die Band 1982 hat sich den illustren Gast Bj Cole für dieses Projekt eingeladen. Ein lebende Legende, ein Musiker, der schon mit Gott und der Welt gespielt hat, u.a. mit so klingenden Namen wie Sting, Björk, Emmylou Harris, Elton John, Iggy Pop, R.E.M. und Brian Eno. In weiten Bögen werden da Soundlandschaften generiert, werden langsame, suggestive Dynamikblöcke gestapelt, wird eine beinahe liturgische Messe zelebriert. Einen Nachteil hat dieser Silberling, man kann diese hochkonzentrierte Musik nicht nebenbei hören, das geht nicht. Aber dafür wird man als Hörer reich belohnt. Die eindringlichen, wie Eisschollen monoton gegeneinander klickenden Soundquader werden immer wieder durch überraschende und witzige Details voneinander gesprengt, aufgerissen, nur um nachfolgend wieder liebevoll miteinander verbunden zu werden. Großes Kino. Eine höchst interessante Paarung kam hier zusammen, im Dezember 2011 in Bergen: Als wären 1982 nicht ohnehin ein aus ungewöhnlichen Kontrasten heraus agierendes Trio, luden sie für ihr drittes Album ausgerechnet den 65-jährigen englischen Pedal-Steel-Star BJ Cole ins Studio. Nicht alle werden Cole gleich zuordnen können, doch gehört hat ihn garantiert jeder schon; er war als Gast bei so vielen Größen der Rock- und Popmusik zugegen, dass eine Aufzählung die hier mögliche Zeichenanzahl überschreiten würde. Für 1982 erweist sich diese Ausweitung zum Quartett als ebenso fruchtbares Projekt; Coles Instrument fügt sich zwischen Harmonium, Hardangergeige und Schlagzeug ein, als hätte es die Band nie anders gegeben. Und genau das kann man ebenso als Gewinn sehen wie gleichgültig betrachten. Diese improvisierte Folk Music eckt weniger an und ist nicht so komplex wie es bei der vorhergehenden, wunderbaren CD »Pintura« der Fall war, doch die klangliche Verschiebung zum Atmosphärisch-Getragenen bleibt über die recht kurze Laufzeit des Albums meist zu skizziert, um vollständig zu begeistern. Eine Vertiefung dieser musikalischen Ideen möchte man daher gern hören. 1982 är den mest spennande grupp inom fri improvisastion som jag har hört på åratal, och de rekommenderas varmt för all som är det minsta intresserade av improvisation. Nästan omärkligt snuddar man vid olika genrer, samtidigt som musiken bäddar in lyssnaren i en egen, suggestiv klangvärld under långsam förändring. Musikken de fire spiller, har et underfundig folkloristisk drag, ispedd kirkelig tradisjon og eksperimentell vilje. Den siger frem i mørke og lysner i melodisk raffinement. Kvartetten fremmer en norsk tone uten å fremstå som stedbundet. Det er fristende å trekke frem begrepet originalitet. Jeg lar meg overraske av vendingene og nyter ferden. What kind of shoes should be worn to reduce the pain of plantar fasciitis. Frankly, stopping the pain is as far as we care to go. Salon hair has become very diverse and very fashionable since the 1990.